Many arrived in Durban with high hopes. They hoped that the sheer urgency of climate change, especially in Africa, would persuade world leaders and their representatives to take the necessary action to avert global catastrophe. They hoped that dissent inside the meetings would pressure the big polluters to atone for their sins. And they hoped that civil society on the outside would mobilize to change the course of history. Such hopes will haunt us all in the years to come, as we come to grips with the collective atrocity that was COP17. Gangs of men were at work trying to rescue the contents of the burning shacks, going from one to another, putting out the fires; or so I thought till with a shock it came to me that these were no rescuers but incendiaries, that the battle I saw them waging was not with the flames but with the rain. This is what they are doing, and this is what they have done. Not respecting the limits of the planet, but turning these very limits into new markets of growth. The delegates were not doctors removing a tumor, but cancer cells ushering in the final metastasis. 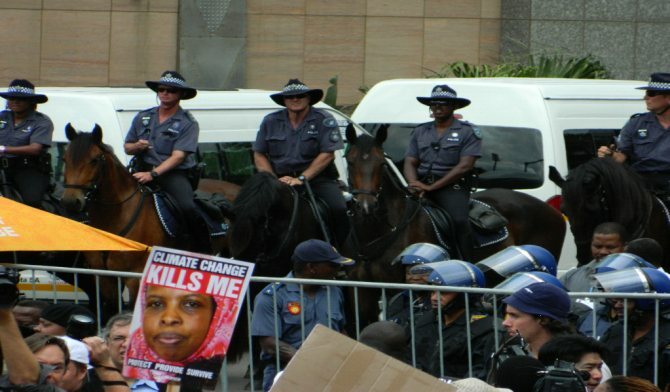 The conclusion of COP17 was a premeditated genocide. The warming of four to seven degrees celsius that is expected to result by the end of the century, given decisions made in Durban, is certain to kill hundreds of millions. But unlike other less bashful genocidal regimes, the UNFCCC pulled out all the stops on PR. “Our leaders style is changing,” Faiz’s poem went on to say. This time genocide is not malicious or xenophobic; it is simply business as usual: mass murder not as bloodlust, but as collateral damage. We can describe the Durban talks in the same way Amilcar Cabral described colonialism in Guinea and Cape Verde: “the policy of smiling and bloodshed.” War rooms have been replaced by eco-friendly convention centers, and extermination camps have grown to the size of continents. So why didn’t it explode? The highest hope of all in Durban was that civil society would either mobilize and Occupy COP, and/or establish a counter-power that would change the course of world events. For a variety of reasons this didn’t happen, and now the realization is sinking in. Not only has the global ruling class committed premeditated genocide, but what is worse, we have let them get away with it. How? how was it poisoned and with what? It is time to ask difficult questions of ourselves. 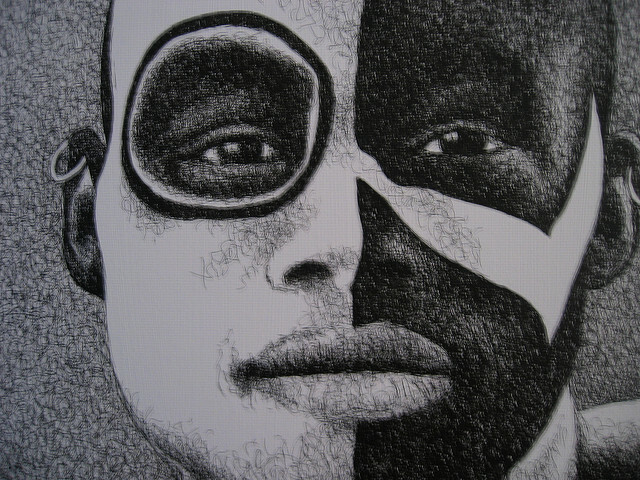 The time for polite conversation, for setting our differences aside, is decidedly over. We must be highly critical of what happened outside the convention center in Durban that allowed those on the inside to get away with it. War has been declared on humanity and nature and we can no longer avoid taking sides. Many believed that it was necessary to have a seat at the official COP17 table in order to mobilize sufficient resources to mitigate climate change. Van Jones for instance has argued in very succinct terms that in order to survive economic and ecological crisis, “we need Goliath to help build the ark”. He speaks for many who made similar arguments in Durban. Unfortunately, there is a fatal error in this reasoning about Goliath. It is a triple misunderstanding — of the insatiable and ecocidal nature of capitalism, of the absolute loyalty of corporate autocracies to the bottom line of profits, and about the fundamental unity of the modern nation-state with the mode of production. To understand all this is to acknowledge that Goliath cannot build the ark. An African proverb reminds us that “only in stories is it possible to cross the river on the shoulders of the crocodile’s friend.” The first lesson from COP17 is that sitting at the table of our adversaries only serves to legitimize them and to distract and demobilize us from the necessary struggle against Goliath. The second lesson from COP17 is that we must be highly critical of the leadership of civil society, particularly the big international NGOs. These are the veterans of an infinity of inter-continental meetings, who COP-hop around the world with massive carbon footprints but little else to show for their efforts. Hugo Chavez remarked that presidents go from summit to summit, while people go from abyss to abyss. The same can be said about most self-appointed leaders of civil society. Voyeurs to genocide, this purportedly dissident grouping was altogether well behaved in Durban. The small exceptions of symobolic resistance in the final hours were totally incommensurate with what was at stake for everyone who didn’t have the privilege to be there. We can say about these civil society leaders what Antonio Gramsci said about some of the political activists of his day; they are “‘vanguards’ without armies to back them up, ‘commandos’ without infantry or artillery.” The powerlessness behind the flashy media presence of these major NGOs is revealed at the highly publicized rallies which so few attend. The fact that these vanguards have no armies is not a coincidence. Accountable not to mass bases but to major funders (some of them in the dirty energy sector), many of the major NGOs actually take up positions contrary to the people they claim to support. The World Wildlife Fund and Oxfam, to name only two self-righteous examples, persist in supporting market-based solutions to climate change, despite widespread opposition to these false solutions from movements around the world. The predominance of NGOs in Durban was on the whole confusing and debilitating. With much of civil society participating inside the COP17 meetings, and many UN delegates visiting the People’s Space, there was never a clear distinction between inside and outside. As a result it was practically impossible to either strategize mass militant direct action in the short term, or to formulate long term collective plans for the necessary struggle against imperialism. A final lesson from COP17 is that we must struggle for ideological clarity within civil society, and be unafraid of the conflicts and ruptures that will ensue. If we are to overcome the forces behind climate change, we must begin to draw lines in the growing desert sands. COP17 was not a dead space, as some argued, but a dead zone, with all the ecological implications. Like all dead zones, it was not just dead but gangrenous, infecting whatever it touched with necrosis. It was not just a phantom limb with immaterial twitches like greenwashing. It was a tumor, a tumor at the center of the world that threatens to infect the future with terminal cancer. The results and prospects are not apocalypse, but something much worse. The real apocalypse is that there is no apocalypse; that all this will continue, and that the NGOs will still be lobbying for a seat at the table as oceans swallow islands and deserts consume continents. The second comparison we can make is to the nuclear arms race. Like nuclear war, catastrophic climate change threatens humanity with mutually assured destruction, which only the rich in their (eco-)bunkers will survive. Reflecting on this, we may remember the words of Alex Comfort at the inaugural meeing of the campaign for nuclear disarmament in 1955: “Sanity is always hardest to restore at the summit — the air here is rarefied. It seems to affect the brain. We can assert it at the base.” In the rarefied atmosphere of climate change summits, world leaders locked in a global genocide, and a civilized society let it happen. Never again! As Alex Comfort suggested, and as Eddie Yuen knew in Cancun at COP16, life, and politics is, elsewhere. Not at the summit, but the base. This is the path and the understanding we need to have coming out of Durban. We need to stop chasing the ruling class around the world to meetings we can never hope to seriously influence in any fundamental way. We need to cut off and leave behind those elements of civil society that do not share our existential commitment to struggle against all forms of apartheid. Not only should we never again trust a COP, but we should take the Situationist slogan more seriously, and kill the COP in our heads. Sanity must be restored at the base, as it was at the Cochabamba climate talks in 2010. We need to leave behind our fetish of the summits, and meet the people in the abysses that presidents and NGOs fear. Thus begins our down-going — down to the people, to the grassroots — and thus begins our return to the source, which as Amilcar Cabral suggested so long ago, is the only path to liberation and justice. While COP17 is over, the reverberations have only just begun. We are only beginning to comprehend the nightmare that Durban has ushered into reality. In a few final reports, I will reflect on the two horizons which will define this century — the one receding behind us and the other rising before us.